We had been here before and we were back again to gather more rocks. I chuckled inwardly as Dane encouraged me to take the smaller bag instead of the larger one. He knows my delight and unending desire for gathering rocks. As I waded along the water’s edge looking for rocks, I felt young, maybe about 7 or 8. My mind wandered gleefully back to the beginnings of my love of hunting for rocks. I admired my neighbor Gloria. She had silky black hair that reached below her waist. She braided it precisely each morning and wrapped it into a large bun secured by beaded hair pins. She never had children of her own, though she talked often of wishing she could. One day she invited me on her morning walk. Our feet shuffled through the gravel as we walked along the railroad tracks. Gloria reached down and picked up a round rock. She called it an Indian Bead and encouraged me to look for my own. I’d never heard of them before and I was intrigued. I have since learned that those Indian Beads are actually fossils. I walked on a bit and soon found one and then another. Before long I had a handful of beads. I was forever hooked. Life changed, Gloria moved and we didn’t take our walks anymore. I found a huge hill of pebbles at a gravel pit close to my grandmother’s house. I went there often, sitting on top of the warm pebbles looking for Indian beads. It was my secret place. The pebble hill was a place I could get away to think, relax and be a happy little girl. No one was around to make fun of my delight in rocks. Many beads had holes through them and I strung them on yarn, making necklaces. Others I tucked away in a special box in my drawer well hidden. Though I eventually stopped hunting Indian Beads, my love of collecting rocks has continued into my adult years. In our years of traveling I have collected rocks for my gardens. I can walk you through my yard and point out specific rocks and what state they came from. I have rocks my grandchildren and I gathered in sight of a majestic castle in France, rocks from Lake Geneva, Switzerland, Italy, Mexico and the Dominican Repubic. I have some rocks I gathered in Cuba to remind me of my special friends there. For the past few years I have focused on finding heart shaped rocks. They hold the most prominent places in my home and gardens. The smooth rocks I chose at the water’s edge will be on the antique trunk in our great room this fall. 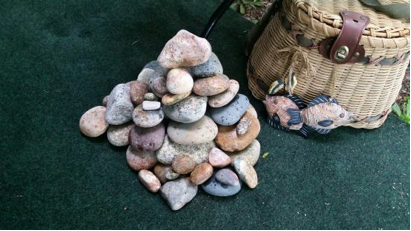 My granchildren love stacking and rearranging the rocks I’ve collected. While Gloria’s invitation began my joy of collecting rocks, it was so much more. 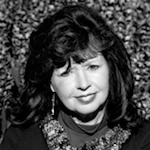 Gloria didn’t know that the hours spent with her were a refuge for me as a young girl enduring great harm behind the closed doors of my home. As we walked, we talked and dreamed of what could be for each of us. I didn’t know how to dream back then. She showed me the path to accepting what was, but dreaming for more. Several years ago I received a package in the mail from Gloria. It contained pictures of us and a small package of Indian Beads we had gathered together. The photos bring back sweet memories and the beads are a precious treasure to me. As I gathered rocks along the lakeshore my heart went back to Gloria and the little girl. I felt the place within me that delights just as I did back then. The little girl came to play with the grown up woman I’ve become on the edge of the lake gathering rocks. What a lovely reflection; thanks for sharing. I, too, love stones and collect heart-shaped ones. 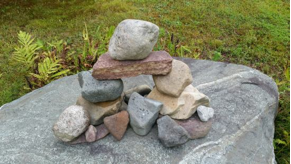 I moved to Michigan two years ago and have been lining my flower beds with what I call “Michigan stones” and my brother calls field stones. They remind me of summers up north when I was a child. Oh, I loved this Valerie! Especially your ending: “As I gathered rocks along the lakeshore my heart went back to Gloria and the little girl. I felt the place within me that delights just as I did back then. The little girl came to play with the grown up woman I’ve become on the edge of the lake gathering rocks.” You remind me that it is okay (and even good) to remember the “little girl” part of my heart. I have spent time trying to picture you walking and collecting rocks with Gloria. Play doesn’t come easy for me. I have to be intentional. That made the encounter with the young me on the edge of the shore more special. It feels good to know that sharing my story invites you to remember your “little girl” places. So often your posts encourage me to ponder something I’ve not remembered before, or stuffed deeply inside. I love that about you Becky. Thanks for your encouragement. Dear Valerie, this lovely reflection warms my heart and is leading me to embrace my own little girl and remember the places she found hope and delight in the midst of harm. Thank you for sharing!